I generally avoid political discourse in this space. Casino gambling, and legalized gambling in general, has been a hot button issue in Massachusetts these past few years. Many level headed people have vastly different opinions about the short and long term economic impact of gaming in Massachusetts. On the plus side there will most assuredly be at least some new jobs. In the negative column, as Nobel Prize winning economist Paul Samuelson put it: “[Gambling] involves simply sterile transfers of money or goods between individuals, creating no new money or goods. 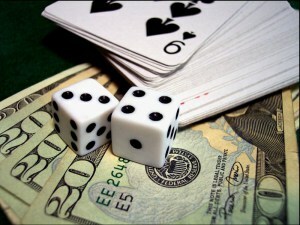 Although it creates no output, gambling does nevertheless absorb time and resources. When pursued beyond the limits of recreation, where the main purpose after all is to kill time, gambling subtracts from the national income.” Regardless of the overall impact on the economy, on a personal level gambling, and gambling addiction, can lead to insolvency. Whether it is the debts incurred directly as a result of gambling losses, or because losses due to gambling have soaked up funds that would have been used to pay for other things, gambling can lead to financial disaster. Currently Massachusetts has no legal casinos. But as we are all aware, that is something that will be changing soon. Even without casinos here, I do see some clients who can trace their financial difficulties to gambling. After all, we are a relatively short drive from Foxwoods and Mohegan Sun, and planes depart for Las Vegas from Boston every day. When the casinos are finally built in Massachusetts, I anticipate I will see a great deal more of this “type” of bankruptcy debtor. Gambling debts, like most other unsecured debts, may be discharged in bankruptcy, and are routinely discharged. Of course, most casinos understand this and usually don’t directly lend money to their patrons. Typically debtors are looking to rid themselves of debts incurred in order to feed their game (or perhaps their addiction to the game). Often this is in the form of cash advances on credit cards, personal loans or other advances. These debts, like most other unsecured debts, are also typically dischargeable in a personal bankruptcy. Though the debt is, like other debts, generally dischargeable in a personal bankruptcy, all creditors have the right to object to the dischargeabilty of the debt owed to them based on a number of factors. There are a few avenues that a creditor could pursue to object to the discharge of its debts. Among them is the exception for fraud found in Bankruptcy Code § 523(a)(2)(A) which provides an exception to the discharge for debts incurred as the result of “false pretenses, a false representation or actual fraud.” In short the creditor has the burden to prove that the debtor borrowed the money with no actual intent to pay the debt or knowing that she would be unable to pay the debt back. A few years ago there was a flutter of adversary proceedings [i.e., lawsuits within the overall bankruptcy case] brought by creditors seeking to recover money owed as a result of the cash advances taken out at casinos or for the purposes of gambling. The crux of the arguments was, often, that the debtor knew she couldn’t pay the debt back. It is the creditor’s burden to prove that the debtor knew she could not pay the debt back, which is a difficult task. More importantly, the reality is whether it is a long term gambling addiction or a short term rush at the casino, most people in the heat of the moment while gambling honestly believe they will be back in the black if they just keep playing. They truly (though perhaps illogically) believe the risk will pay off; that luck is about to turn in their favor. Many of the cases resulted in a discharge for the debtor, and fewer of these sorts of challenges to the discharge are playing out today. Nonetheless, it is something that any debtor with debts due to gambling should be aware. Another avenue for excluding a debt from discharge is found at Bankruptcy Code § 523(a)(2)(C), which an exception to the discharge for debts incurred for certain luxury goods or for cash advances (both could be applicable) incurred within 60 days of the bankruptcy petition date. This could be an easier hurdle for the creditor to jump in order to avoid a discharge of the debt. However, it also SHOULD be an easier road for the debtor, by simply waiting for the requisite time to pass before filing the case. Outside of the gambling situation, I have seen cases — typically just after Christmas — when people have spent a little more than they should have on the holidays — where we simply wait. In that instance it is typically easy enough because there is usually no real compulsion to spend money. However, for the compulsive gambler, it could be a greater challenge, and necessitates a close review of all credit card statements by the attorney. Like many financial issues in bankruptcy, the Bankruptcy Code mandates that a debtor disclose all gambling losses incurred during the 12 months prior to filing the bankruptcy case. The purpose is to allow creditors, the bankruptcy trustee and the Court to determine if their is fraud in the filing, if assets are being sheltered or if there is a problem that might result in the inability to confirm a Chapter 13 plan. Bankruptcy Trustees have broad powers to avoid transfers that may be fraudulent (where the debtor received less than reasonably equivalent value) or preferential in nature (where a creditor received more than they would have received in a liquidation under Chapter 7. In Chapter 13, a compulsive gambler’s Chapter 13 plan (or Chapter 11 or Chapter 12 plan for that matter) could be subject to an objection (or at least have a court, trustee and certain key creditors looking very closely at the proposed plan) as the debtor’s income is expected to fund the plan. A trustee or a creditor could object to the feasibility of a plan where gambling losses are regular part of the debtor’s month, as indicated in the disclosure described above. More importantly, where compulsive gambling have caused a debtor to fall behind on her mortgage, car loan or taxes, and thus forced a debtor into Chapter 13, continued gambling can easily cause a confirmed plan to fail for failure to meet the obligations of the plan by making plan payments. If you or someone you care about faces an addiction to gambling, by all means contact gamblers anonymous immediately. If you or someone you care about is struggling with the debts resulting from gambling or from other causes, schedule a free consultation with an experienced bankruptcy lawyer who cares about his clients today. Contact the Law Offices of James Wingfield at 508-797-0200, visit the contact page on our website or fill out the form below to email me directly.